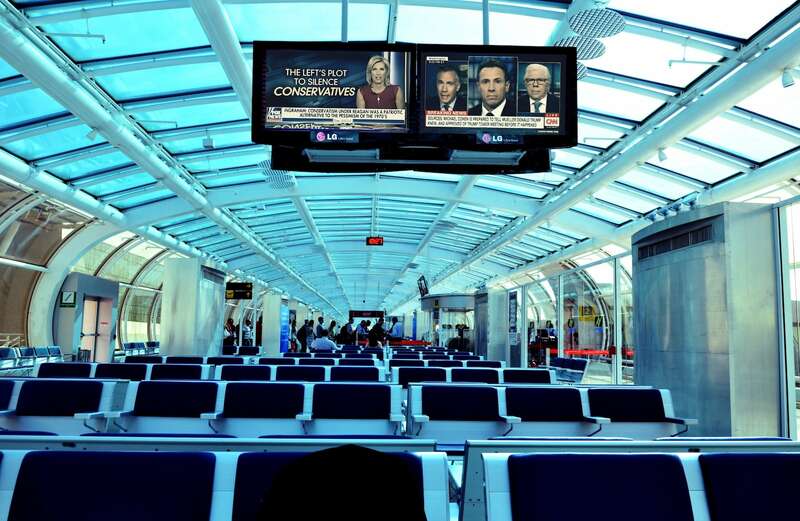 By Frank Waddell Sept. 11, 2018, 9 a.m.
Have you been traveling and noticed that all the televisions in an airport terminal were set to CNN? Or grabbed a drink at a bar and realized that Fox News was being broadcast to its customers? You might grouse that you’re being forced to watch something that doesn’t jive with your political views. Or maybe you think it’s no big deal — your views are already fully formed, so you can just tune it out. Studies from communication science tell us that the effects unfold in two steps. First, audiences will often overestimate the influence of media on the other people in the room, while underestimating how broadcasts influence their own views and beliefs. This is called the “third-person effect,” and it’s most likely to happen when people don’t want the media to influence other people. For example: Say a conservative woman who is a regular viewer of Fox News dines at a restaurant that has MSNBC playing. She’s more likely to think that the broadcast wields power over the other customers — without taking into account the effect that her own regular consumption of Fox News has on her own views. The second part of the process involves what communications scholars call “the influence of presumed influence model.” Initially tested on how anti-smoking ads influence groups of young people — and since applied to a range of topics, including politics — its central tenet is that if you presume someone is being influenced by media, you’ll change your own behaviors. Another study looked at political ads. It found that if you believe others are seeing — and being affected by — political ads on behalf of a candidate you don’t support, you might be more likely to vote in that election in order to prevent that politician from winning. Not all behaviors are active, however. When you think your views are in the minority, you’re more likely to be passive in your response to media. So if a liberal goes to a barbershop in a conservative city like Colorado Springs and hears Rush Limbaugh on the radio, they’ll be less likely to ask the barber to switch the station, or to start a conversation about politics. The stations being broadcast in restaurants or hotel lobbies might simply be the decision of a business owner or building manager. Most likely, they’re assuming that their political preferences are consistent with those of the public — a tendency known as the false consensus effect — and are choosing channels accordingly. Time Warner’s CNN airport package is the most widespread: 59 airports across the nation air CNN to an audience of 323 million annual travelers. Fox News has criticized what it calls CNN’s “airport monopoly.” Thousands of have signed petitions demanding the removal of CNN from airport televisions — a response to the perceived ideological slant of the channel. These petitions are a clear example of the “influence of presumed influence model” in action. Because they fear CNN is exerting undue political influence on their fellow travelers, these petitioners — presumably conservatives — seek to censor it. In other words, the prospect of these broadcasts changing their own political views isn’t really what they’re upset about. They’re more concerned that CNN will shape the attitudes of others. This might also explain why some partisan petitioners don’t simply advocate for something apolitical to air on airport TVs. “Please replace [CNN] with either Fox News or Christian News Network,” a Change.org petitioner wrote. Frank Waddell is an assistant professor of journalism at the University of Florida. This article is republished from The Conversation. Photo illustration based on photo of Aeroporto Santos Dumont by Rodrigo Soldon Souza used under a Creative Commons license. POSTED Sept. 11, 2018, 9 a.m.